GREEN BAY, Wis. — You did it again Northeast Wisconsin. The Green Bay Metro Fire Department and NBC26 asked for help with the Gifts for Teens drive and you delivered in a big way! Looking out over a plethora of presents, Paramedic Chad Decker can't help but to laugh. "Yeah, I'm a little numb to be honest." Decker envisions the smiles teens in need will have on their faces when they open their gifts on Christmas. "This is overwhelming. This is the culmination of months of work and really a community effort." It's an effort that Decker spearheaded eight years ago to fill a gap in holiday gift giving. "Everybody remembers the children and that's awesome. I think it's also awesome that we remember the teenagers, because they're in the middle there," said Gifts for Teens donor Renee Wadle. We met Wadle and so many other generous donors during our one day Gifts for Teens drive at Shopko last week. Shopper after shopper generously reached into their wallets to give. Diane Martin said, "I like to donate to any cause that's worthy, and I think teenagers are a very worthy cause." "I hope they feel excited and happy that they can get a present that they might not otherwise be able to get," added Rachel Heath. From the mall to the streets of Green Bay, firefighters put on nighttime parades with Santa. The neighborhoods they serve were glad to pay it forward by doubling the amount of monetary donations compared to last year. "I think they understand that being a teenager is tough, and it's even tougher if you get forgotten at Christmas," Decker explained. 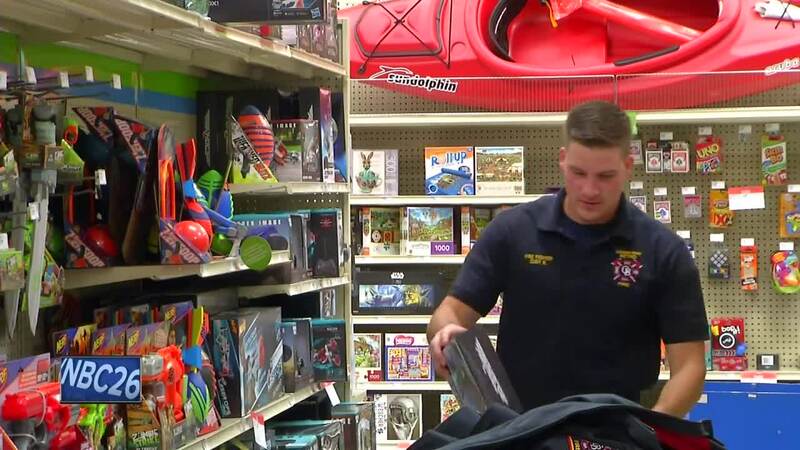 Firefighters used the cash collected to purchase age-appropriate gifts like make-up, sports equipment and even robots and drones. On Tuesday, the firefighters loaded up their emergency vehicles and transported all the goodies to the Salvation Army's Christmas distribution site at Shopko Hall. Bag after bag, we filled up tables with over 1,600 gifts for teens which is 400 more presents compared to last year. "Amazing. Overwhelming generosity," is how Nan Pahl described it. As Director of Social Services, she sees first-hand the relief parents feel on distribution day. "I get to stand at the front when people are leaving, and to hear families say, 'I don't know what I would've done without this. My children are going to be so excited,' just makes my heart warm." Decker said it makes all the hard work worth it, but he couldn't have done it without the backing of the community. "Just thank you. You've really made a difference, and showing how much you care and showing how much you're willing to support us in our mission really means a lot." Decker is also proud of his fellow firefighters who set their own record this year by donating over $2,500 out of their own pockets.